While this tasty trend is certainly not unique to the NYC area, over the last few years we’ve seen an explosion in Burger-only, high-end specialty shops pop up in various parts of the area. In the coming weeks, a new burger restaurant, Mocha Burger, is opening near NYU. Earlier this year, the modern beautiful burger restaurant, Boeuf & Bun, opened in Crown Heights. The nearly 3 year old Amsterdam Burger Co. (run by Mike’s Bistro) on the UWS has been a catalyst in driving burger innovation around the city and is in process of opening a second location in the 5 Towns. Teaneck’s Gotham Burger expanded with a 2nd location on the UWS 2 years ago. Mr. Broadway changed their menu in late 2012 to include specialty burgers more commonly found at these only burger-only shops. The Prime Group opened up Prime Burger on the UWS last year competing with both ABC & Gotham and is also opening a second location in Flatbush, Brooklyn. Mike’s Burgers in the 5 Towns turned the former ‘Burgers Bar’ & ‘Burgers’ joint into another specialty burger shop last year. The Teaneck Doghouse opened last year serving burgers with a wide array of toppings and options. Bistro Burger opened in late 2013 in Great Neck providing more burger flavors to the north shore. 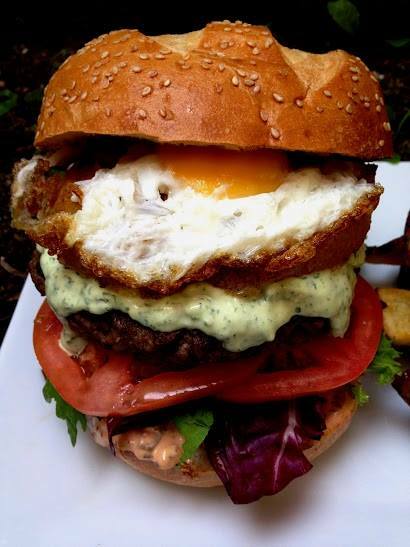 Le Marais, Abigaels, Reserve Cut, Prime Grill, Wolf & Lamb, Pardes, Chagall Bistro, and other high-end NYC restaurants all serve a multitude of burgers for the refining palettes of Jewish foodies. Eli’s reopened as Char Bar in DC with an extensive burger menu last year. 2 new restaurants in the Miami area, Fuego BBQ & Smokehouse & Backyard BBQ, bring numerous new burger options to the Sunshine State. Milt’s BBQ in Chicago (opened 2 years ago) throws brisket, chili, and “bacon” on their burger. Half-year-old Prime Deli in Minneapolis serves up some innovative burgers. This of course doesn’t even discuss all of the Burger joints popping up all over Israel the last few years. Here’s an article on Jerusalem’s Top Kosher Burger restaurants. BBQ Burger at @mrbroadwaynyc for lunch earlier today. Their #burgers are always good. The Burger Deluxe @ Hapisgah in #Queens. You can find this #kosher #burger at @pinatisp in #SaoPaulo #Brazil. Amazing!